When I was in Bangladesh we were eager to attend weddings not only to wish the bride and groom a happy married life, but also because we could enjoy a plate of delicious authentic Biriyani or Biryani. Just as I am writing the word – I can smell it! All sorts of spices, basmati rice, ghee, fried onions and potatoes! Ahh! I am salivating just thinking about it. The name Biriyani is derived from a Persian word berya which means “fried” or “roasted.” This dish is a mixture of rice and meat that is fried separately before cooking. Traditionally potatoes are fried and added to the Biriyani and dry fruits such as almonds and cashews are used to garnish. I am giving this Biriyani recipe a twist. Following the exact recipe (although there are many variations) I learned when I was in Bangladesh – I am switching meat with mushrooms. I promise you the taste is mouth-watering. This is not just a recipe – it is an adventure of spices that you will be diving into. Caution – this is not for the meager hearts! You must be bold and delve deep to take up a delicious traditional meal and give it a vegetarian twist. It will be meaty without the flesh and delicious without compromising any of traditional spices. Call your family into the kitchen and drown deep into the world of spices. Call your closest friends for a special lunch to enjoy this royal feast. I urge you to get all the spices from either an Indian grocery store (You will find all the spices listed) or at the Bulk Barn (a store where spices are sold loose). Follow the steps I provided and your biryani will turn out absolutely great. See the recipe box for the Authentic Mushroom Biryani Recipe that you can enjoy with your family. Mushroom and rice will be cooked in two separate pots and then mixed together after cooking. 1. Make sure all dry whole spices and powdered spices are pre-measured and ready for cooking. 2. Dry roast the whole spices for 2 minutes and keep them aside. The whole spices mentioned above will become fragrant. 3. In a pan heat 2-3 Tbsp. ghee or coconut oil and add the onions. Fry them till they become crispy and brown. This form of caramelized onion is also known as ‘bereshta’. 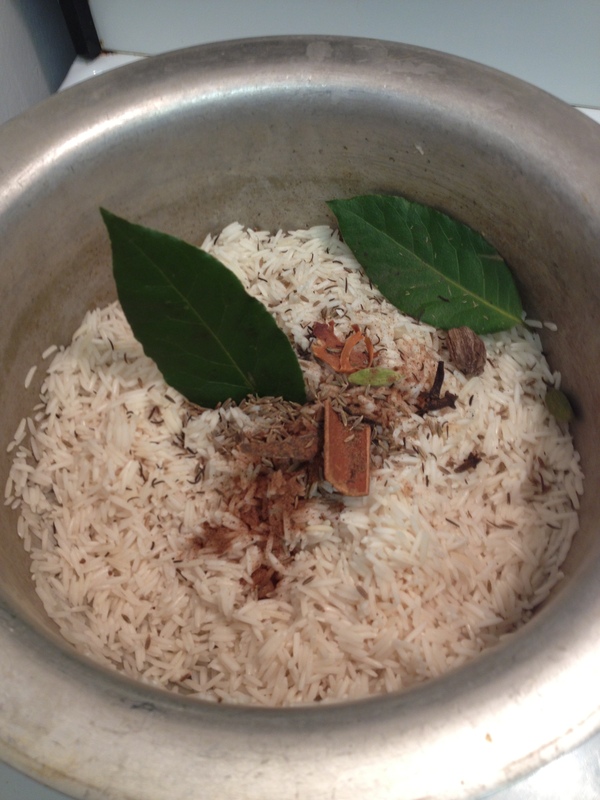 This is a very crucial part of this recipe as ‘bereshta’ will give this biriyani the authentic flavour. Keep some ‘bereshta’ aside for garnishing. 4. In a small bowl pour the milk and add the saffron strands and let it soak. 5. Get the tomatoes and ginger-garlic paste ready. Align the curry leaves, cilantro, mint leaves and slit the green chilis from the middle. 1. Cook the rice in water and stock until cooked. 2. Add the saffron milk in the pot 10 minutes before the rice is completely ready. 3. Cover and cook until rice is done. 1. In a large pot heat ghee and add the whole spices, and powdered spices. 2. Add the tomatoes, ginger-garlic paste, curry leaves, green chilies, and half of the mint-coriander leaves. 3. Fry for 5 minutes. 4. After frying cover the pot and let the masala coo for 10 minutes. Add a little stock or water so that the gravy cooks well and does not get burnt. 5. After the masala or spice mixes are cooked, add the tomatoes and cook till tomatoes are mushy. 7. Sauté for 2-3 minutes. 8. Add 2 cups water and stir. 9. Cover the pot with a lid and let the mushrooms cook for some 4-5 minutes. 10. Once mushrooms are cooked turn off the heat. Step 4: Putting the Biriyani together. 1. In a serving dish start layering the rice and then the mushroom. First layer the rice and then the mushrooms and then the rice again. Do this until you use up all of the rice and mushroom. 2. Garnish with bereshta or fried onion, cilantro leaves. 3. Enjoy a bowl of mushroom biriyani with raita (yogurt sauce). This sounds yummy! I’ve never cooked with so many spices before so this would be an adventure. YUM Yum!!! This looks soooo delicious. I love biryani. Thanks for sharing. Mmmm I can smell it now and I’m salivating just thinking about it. Sounds so delicious! Sometimes for some grand recipes you have to give some love! Quick and easy recipes will be coming up soon.